We went downstairs, through the large cool storage room below, to the boat which would take us out to Mr Field’s Young Generation, a Young 88, to take part in the family race, held every fourth Sunday. I asked about the races Avalon Sailing Club runs. Apart from the family race, which is around three hours in length, the club also runs the Blue Water Shield (4-5 hours); A handicap series raced on courses which include a mark laid approximately one mile off shore from Lion Island, the Quartet Bowl; A handicap series raced on courses that include a mark laid off Juno Point, Twilight Races: Individual handicap races sailed on alternate Fridays during Daylight Saving, and the Van Den Bosch Trophy; For perseverance in fair weather and foul; awarded to the yacht competing in the most events during the year, providing it has not been a prize winner in any series, among others. Blink of confusion; bucket of water?...weight sensitive??? As soon as we are clear of the moored vessels Norm turns the engine off and we use the sails to get to the start boat off Taylors point. We are racing Course 35, one of many courses that form part of the racing calendar, and would sail to and around the markers at Stokes Point to Towlers Bay, back to Stokes and then to Rocky Point before heading back to cross the line where we began and head back to the club. Under the patient tutelage of these two gentlemen one learns what a beam is, a mainsail, a jib, the various kinds of tacks such as a fast tack, how to release the sail and when and how it’s best to pull it back on fully if you’re on the side of the yacht and responsible for straightening the jib or letting it slacken slightly so it fills with breeze. What you learn as an extra is these men knew what wind was running, from what direction and when it is due to arrive. Norm knew where on Pittwater you tack, turn and which points to head towards to catch a small breeze if the air is stilling (We’ll head to Longnose for a tack). It was all about how to establish, keep and increase momentum. While Geoff patiently untangles the rope I’ve crocheted Norm, always polite, affable and calm, asks me to shift to the opposite side of the yacht and lean. As soon as I have he smiles…may be time for that bucket of water. Young Generation is a weight sensitive boat and moving crew to add extra thrust or balance works better if the crew have a bit of weight to begin with. Obligingly, feet are dipped into nearby brine but this doesn’t help much. Leaning further does, a bit. She’s a beautiful craft and the smallest shift from smaller sailors does cause her to also shift. Gives grounding and allows children and young adults to learn discipline and perseverence; can use this everywhere else in their lives thereafter and continue to develop this in themselves to achieve dreams. Establishes the knowledge and skills of sailing and parallels how knowledge and skills are important to acquire, maintain and further in every other aspect of their lives ever after. Promotes physical well being and fitness; a person must stay alert, be ready to move and you sleep very well after a day’s sailing. Memories created are great to reflect on or refer back to in times of stress ever after; as well as for the big smile they will ever bring. There’s something about sailing, a kinship with yacht as though you become part of its rhythms that waylays the possibility of seasickness and fills you with Pittwater’s, on this day, both warm and cool and soothing hot foreheads salt dense breezes. 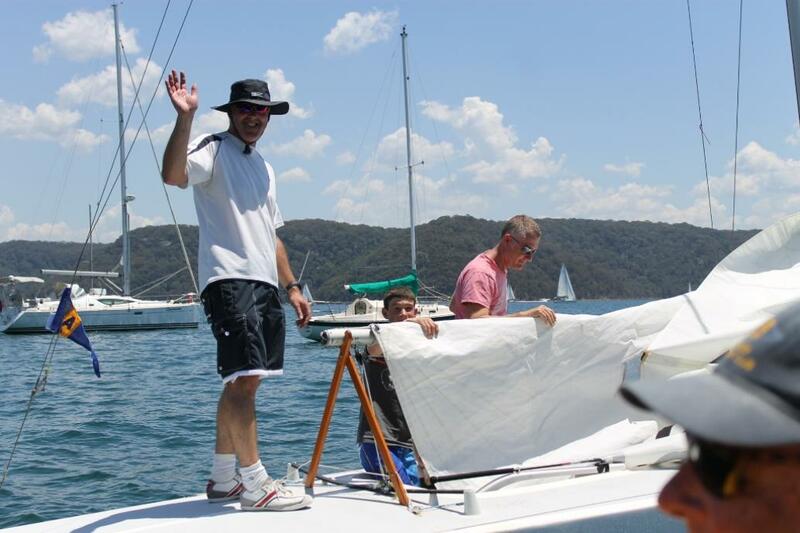 Or perhaps it’s simply that Norm’s Young Generation, sailed by him for 22 years now, has carried many a Pittwater resident out for their first ever sail and seemed to be smiling with us, happy to have one pretty excited vegemite on board. Either way it was pure bliss, a revelation and a privilege to learn from men whose knowledge of the estuary, its winds and where to catch them, allowed a novice to experience a few basics of ‘how to sail’. The parts of a beautiful yacht were no longer names for apparatus but living parts of something that moves. The various points, bays and beaches of the estuary are clearly just as well known and well loved by others and salute you as you salute them. A whole new world has opened… the estuary, and those who sail on her, has a water ruled side you can’t imagine by looking at it and those who sail on her! Somehow Norm and Geoff won even with ‘the novice’ on board; a testament to their own skills and decades on the estuary. Back at the clubhouse a winner’s bottle of port to be imbibed with the customary BBQ that follows these family races was in order. Sunburnt, aching and exhilarated despite exhaustion from loading that Sunday’s Issue until dawn, this imbibing was deferred for the next time they win with this novice on board. I’ll be back, for sure. Longnose, Stokes Point, Towlers, Taylors and Rocky Point all have added presence now, only it is the water and the wind that murmer their names... In short...it was one of the best afternoons of my life. 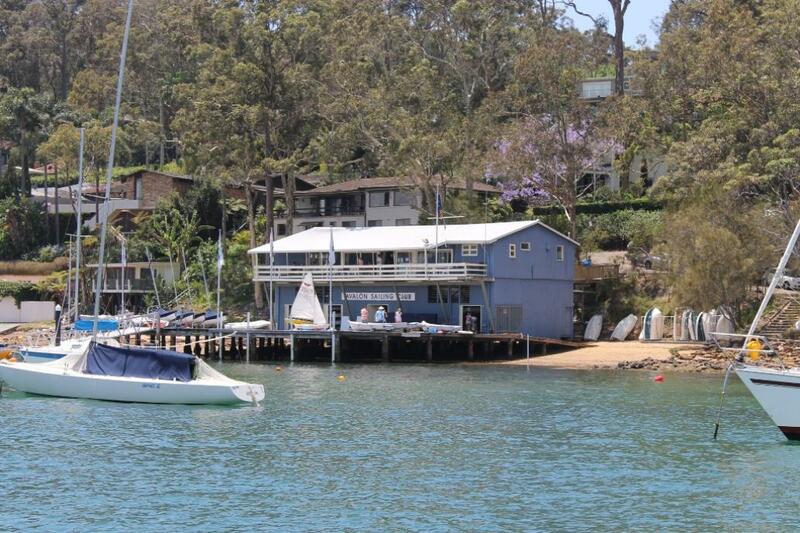 Avalon Sailing Club is at the beginning of Hudson Parade (you can see the sign pointing in just as you head down the hill) and welcomes new members. They have a great Centreboard program for youngsters. Website with full details here. Report and photographs by A J Guesdon, 2012. All Rights Reserved.